Heading to the Dollar Store? Get supplies for a Scooping Station! Dude. The Dollar Store is where it’s at sometimes. 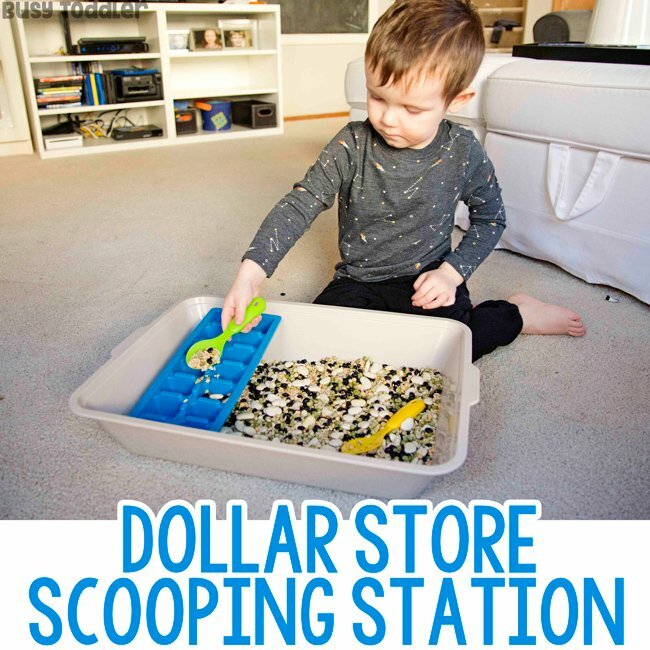 I’m a broken record on how kids activities DO NOT need to be glamorous or expensive and here is a prime example: a dollar store scooping station. RELATED: Curious what else you can find for activities at the Dollar Store? Here’s what I love! Yes! This whole activities is from the Dollar Store! The scoops are from a kid’s cooking set. The ice cube trays come in a two-pack and we love them. 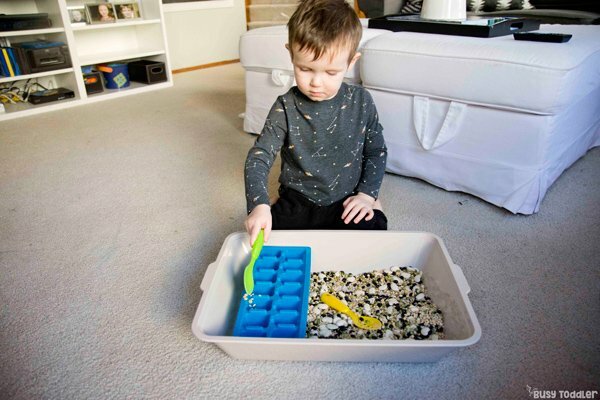 The bin….oh the actual bin my sensory bin is made with is a kitty litter pan. I pretty much LOL to myself every time I use this but it is a gem of an activity supply so I’m just fine with loving on it. Technically, the beans are not from the Dollar Store but since they sell them there – I figured this wasn’t cheating. We’ve had that same set of beans for almost 4 years now – I just save them in a Ziplock bag. Those beans are like family now. Check out the first activity we ever did with these beans – way back when! What is a scooping station? 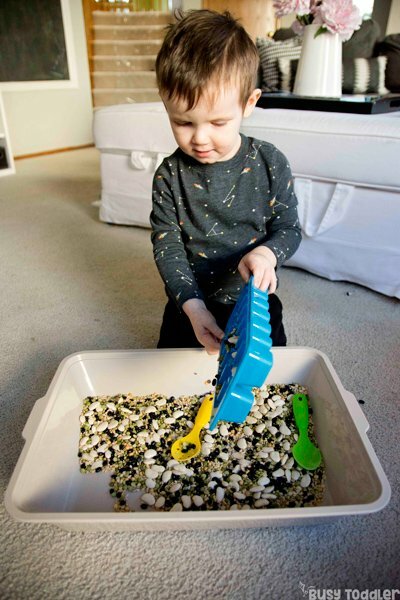 The actual activity / sensory bin that I made for my son is called a scooping station. Scooping stations are an awesome way to give some targeted instruction in how to “scoop and transfer” materials. 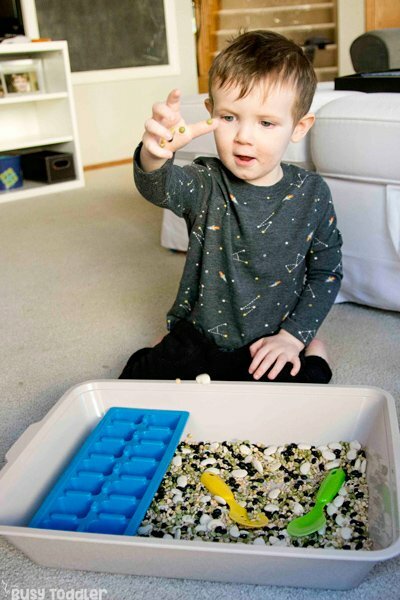 When you think about how many times in life you are asked to scoop and transfer objects, you can see why this is a skill we need to actually teach toddlers how to do. 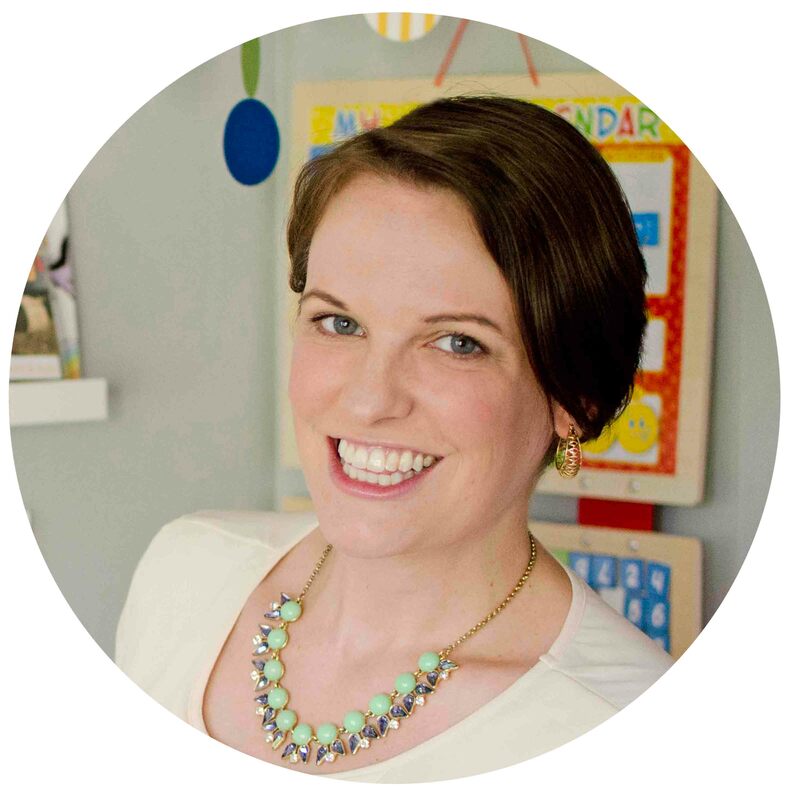 So often, we want to hurry up or get a move on or do it ourselves, and we forget to give kids real world chances to learn an activity is a safe and low key environment. But did he keep it clean? 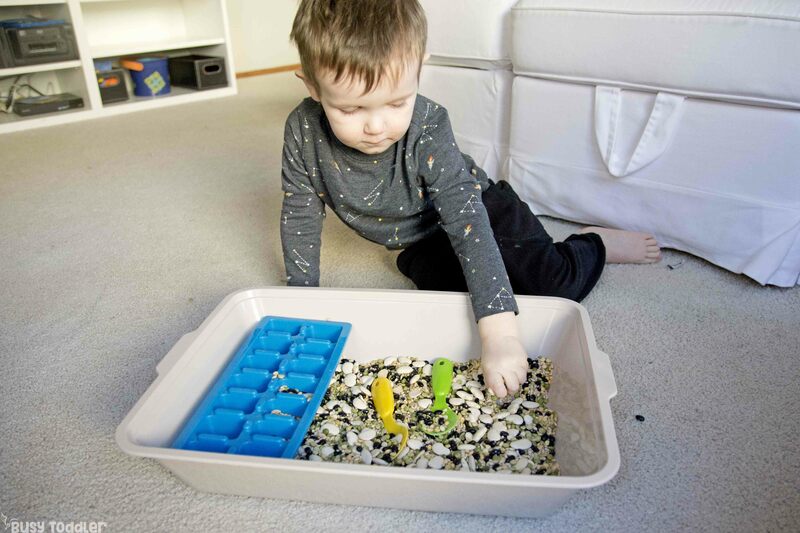 My son – though just 29 months old – is well versed at sensory bins. He’s literally been doing them his whole life and is “trained” in how to do sensory activities. 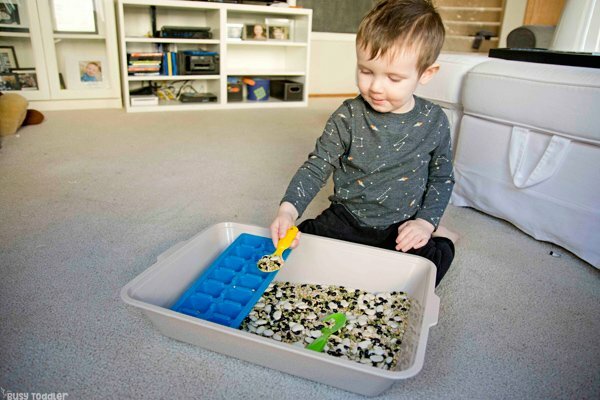 RELATED: See my son’s first sensory bin HERE! We started with taste safe options and this (the beans) were his first real test with a NOT taste safe item. 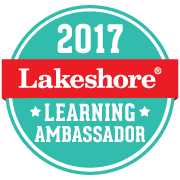 Beans are tricky – please use good judgement and supervision to decide if you child ready for beans. Can you only do a scooping station with beans? You can use rice, cornmeal, and even cereal if you are looking for some really safe options to try. 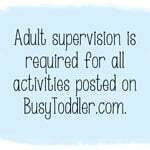 Remember, activities can be twisted and altered to be just right for your kiddo. It’s just a matter of knowing your child and what they are capable of. 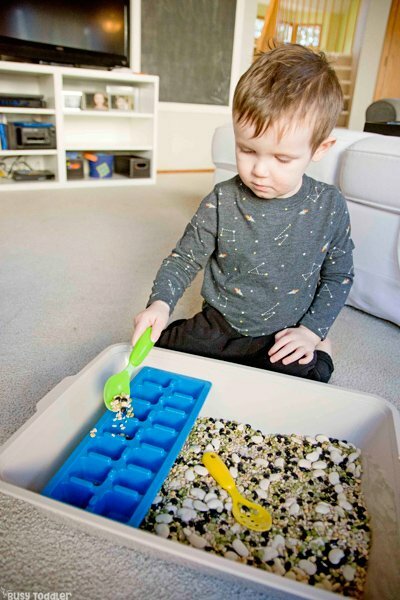 RELATED: Check out this Japanese Rice Sensory Bin full of scooping skills! 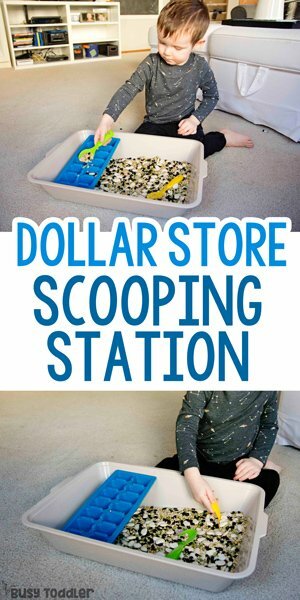 Head out & make a Dollar Store scooping station! 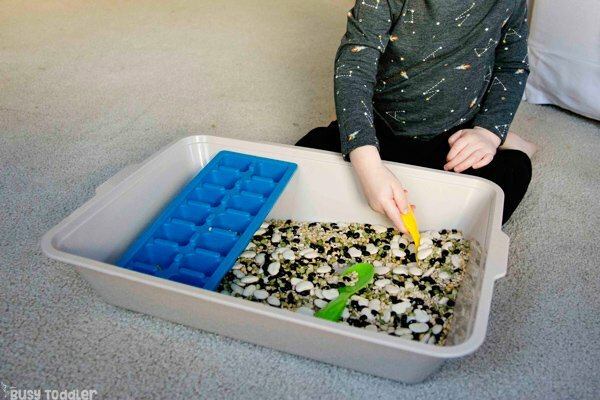 This is one activity that doesn’t get old – and the price point to set it up (especially when you can reuse the materials again and again) is perfection. Good activities don’t need to be fancy. They don’t need to be expensive. They just need to be right for our kids. When will you make a Dollar Store scooping station?